Domestic violence is a serious, widespread public, social and health problem that affects the lives of many women, children and men. There is also evidence to suggest it has one of the highest rates of recidivism. 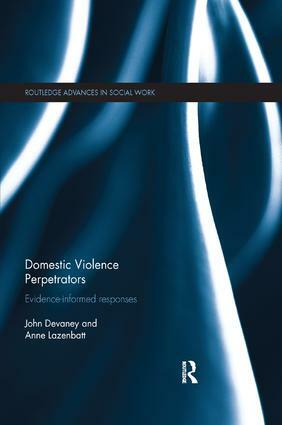 This comprehensive book provides an overview of what the research tells us about the perpetrators of domestic violence and what works, and what doesn’t, in promoting positive change. - where robust evidence is lacking and more research needs to be undertaken. Domestic violence is a significant problem for those individuals and families whose life is affected by this issue, the social, health and criminal justice agencies that respond to it, and wider society which must bear the costs and its devastating effects. This volume is an important reference for all those researching and working with the victims, survivors and perpetrators of domestic violence, including academics and students from fields such as social work, sociology, criminology, psychology and social policy. John Devaney, PhD, is a Senior Lecturer at Queen’s University Belfast, UK. He was a member of the governmental policy group which developed Northern Ireland’s first domestic violence strategy, and has researched and published widely on familial violence. He is a former chair of the British Association for the Study and Prevention of Child Abuse and Neglect. Anne Lazenbatt, PhD, is a former Reader in Childhood Studies at Queen’s University Belfast, UK. She is a psychologist with extensive experience of researching issues related to domestic violence and child maltreatment.